The Internet has always presented mind-boggling possibilities for the way in which people interact with information, services, and merchants. However, with the advent of mobile viewing devices, the Internet has taken on a new level of responsibility, by becoming accessible to anyone, on any device, and at any time. With this change, has come the introduction of Advanced Mobile Pages (AMP), which serves to integrate a user’s website into a mobile-friendly format. Today, the e-commerce market is flooded with AMP themes and plugins like Yoast SEO plugins, which claim to optimize a website. But how does the consumer know that they are receiving all of the necessary features for creating the best mobile-friendly website possible? Here, we will explore and break down the 6 key features to look for in AMP WordPress site plugins and themes for accelerated loading times for instant articles, blog posts, and other web pages. Advanced Mobile Pages are designed to ensure viewers can access requested Internet content fast and efficiently. This may sound simple, but it has been a trial by fire to attain the level of navigation succinctness, which internet users experience today. Before mobile devices with Internet capabilities, online content was only accessible through a computer console—be it a laptop or desktop. When smartphones and tablets came to market with their ability to access an Internet browser as a computer does, it became painfully clear that there would have to be some cleanup at the coding end of things. Before AMP projects, a mobile device would have a difficult time accessing online content, due to a number of back links, redirections, and host connections required. Loading a single web page from a search engine could take up to 15 seconds or more. AMP Google pages rectified this issue by creating a platform with which an existing website could be placed into, which created a lighter data load to handle. AMP pages achieve this by creating an exact replica of one’s existing website and automatically adapting the underlying code to adhere to the maximum capacity of a mobile viewing platform. The result is AMP HTML optimized themes and plugins like Yoast SEO plugins and WordPress sites are at the leading edge of AMP HTML website compatibility. With an AMP project optimized websites, content loads over 10 times as quickly as it would have previously. This matters greatly when considering the Google search engine page ranking algorithm. For a website to appear on the first page of a Google search result, there are many criteria that the site must meet and one of which is the loading time for a user. For instance, without AMP optimization, you will see search results appear on a computer that will not show up on a smartphone, due to the lower processing power of the mobile device and Google’s assertion of how long it will take to load the content on the viewer’s device. After integrating an AMP plugin or theme, theoretically, there will no longer be any differentiation. A WordPress theme is a template that a site developer can place content into. It acts as a framework, often including additional plugins, features, and design elements, which add a high level of control to the end product of a WordPress site.Many themes include several live demo templates, which allow users to select the website template that suits their business best. A number of often less expensive themes have fewer customizable functions and fewer template options from which to choose. Most themes will include a package of useful plugins, which avoids the need to have any webpage coding skills. A WordPress plugin acts as a tool for the theme template to use. 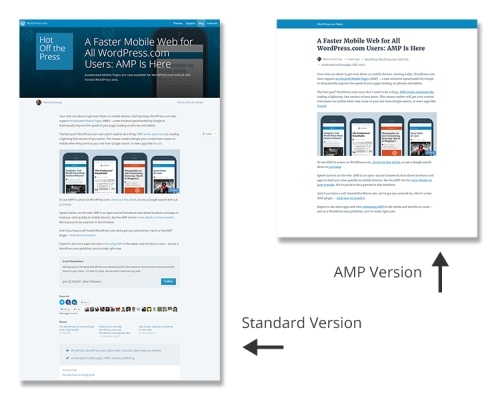 An AMP plugin takes an existing themed website and optimizes it for mobile platforms; however, the quality of the end result is dependent on the quality of the individual plugin. Some AMP plugins allow users to edit their AMP website individually of the original website and others do not. Plugins are a good option for WordPress websites that are already completed and functional. For these, a simple AMP plugin could be all that is required to make your website mobile-friendly. However, it may also present obstacles in non-AMP-compatible elements. If you are in the process of building your website, an AMP WordPress theme will offer the most conclusive solution to the issue of mobile device integration. If you want to integrate an already completed WordPress website, a plugin will likely do the trick. Once you are on the road of optimizing your web content for mobile-friendly viewing, the real choices set in. There are hundreds of downloads offered, which claim to optimize one’s content; however, it can be difficult to tell if any one product will be satisfactory for a user’s needs. Now you can rest easy. We have taken onboard the essential AMP product considerations and then broken them down into 5 key features to look for in AMP themes and plugins. Mobile viewing devices are compact by design and as they should be. Mobile viewing devices offer a high level of mobility but sacrifice a bit of processing power. In addition, mobile devices are not designed with a keyboard for this exact reason. So, it stands to reason that building an AMP web page is much more efficient on a machine that offers a keyboard, mouse, and sufficient processing power to accomplish the task in a timely fashion. For this reason, users will want to be sure that the AMP plugin or theme that they intend on using is designed with the ability to be edited and previewed from a desktop computer.This may seem unnecessary; however, website developers will quickly discover the difficulty inherent issues without the ability to preview one’s AMP site from a desktop. Creating a website is akin to creating a piece of art, decorating a home, or solving a puzzle. This is because a visitor’s experience and assumptions of your online service are dependent on the interface and visual first impressions. Using one’s finger is no way to adequately arrange the many content boxes, sliders, and elements needed for the design of an AMP site. The more control and accuracy one has, the better. If you are not an online merchant, vendor, or service provider, there are still ways to increase revenue. For online bloggers, article writers, and other editorial publications, revenue is not gained by selling a product as much as increasing the value of their online real estate. Online publications depend on viewership to increase the worth of their website and this is where advertisements come into play. If your website is optimized for mobile viewing, but it is not compatible with ad space, it equates to a loss of revenue. Online publishers need a paycheck the same as everyone else and ad space is the best way for the value of their content to be translated into financial worth. When choosing the necessary AMP plugins or themes to integrate into your online publication, it is crucial to be sure that these products are specifically designed to cater to online advertisements. This does not, however, mean that website developers must sell their souls to the devil in order to make a buck. The best WordPress AMP plugins and themes give users many options in the customization of their online advertisement content and how it reaches their viewers. There is no need to succumb to the persistent pop-up ads if you think this would cause a negative effect on your websites viewership. The most important thing is to be sure that your website is AMP ad optimized and has a plethora of customizable ad options. Branding is everything for any business. Just about every editorial publication, blog, or e-store has about one million doppelgangers online offering the same kind of service, product, or information. The trick to success is to stand out and to become a household name that makes its way into a colloquial conversation. This is only achieved through the stamp of your brand. When looking into AMP themes and plugins for WordPress, be aware of how much customizable optionality any one product provides. Some themes and plugins will allow unlimited color customization; however, they will only allow the uploading of an individual logo at an additional cost. Likewise, others may allow an unlimited amount of graphic uploads, but will not allow for the customization of color schemes, fonts, and backgrounds. Finding a theme that corresponds naturally to your businesses brand colors and aesthetic, is like finding a diamond in the rough. The best branding is not made out of a website’s predetermined color dictation. Look for themes and plugins that expand the range of options and customizable content on your websites AMP version. Even though AMP has expanded the range of online content that is instantly viewable from a mobile device, plenty of content is just too demanding. When a viewer attempts to access data-heavy content from a mobile platform, this can be just as deterring as being unable to view the web page at all. For this reason, it is a good idea to find an AMP plugin or theme that allows the administrator full control over which individual pages appear on the. For instance, if there is a website that specializes in online games, the entire website could be perfectly compatible with mobile devices, except for the game. When users attempt to play the game on their smartphone or tablet, it is probable that they will be deterred from playing when the game fails to load. Instead, it is possible to turn that page off for a websites AMP version, thereby bypassing the negative reaction of a prospective client or patron. Just imagine that you stumbled on a website that had an extensive menu bar with options galore, but none of the menu buttons led anywhere. Navigating through a website is as touchy as designing the aesthetic. It is important to structure the transitional graphics, elemental shapes of menu bars, and even the font types to accurately depict the quality of your brand. For example, there is no good reason for an online service to have a product’s page. Alternatively, for a skate park’s web page to be graced in a dainty cursive font, many AMP themes and plugins are designed with the ability to customize these menu navigation elements; however, be aware that some are not. Assuming that any one product will contain the customization features that you require is a heavy bet. The best AMP WordPress themes and plugins come with a Page Builder Tool, usually as a drag-and-drop widget, which allows for full aesthetic and elemental customization of menu bar navigation. Unless you’re adept at coding, you definitely want an AMP-ready theme/plugin combo that is easy to use and generates properly AMP validated content out-of-the-box. This is where the desktop AMP preview feature comes in handy as well so that you can quickly check whether your AMP pages and posts are displaying properly. The last thing you want is an email from your Google Search Console notifying you about a host of critical AMP errors on your site. Speaking of Google Search Console, you definitely want to get your AMP site set up on Google Search Console so that in the event there are errors, you’ll be notified and can then fix them. Your online presence, website, and AMP version are the equivalents of a brick and mortar storefront. When it comes to your business and how it is viewed by your customers, control is key. The 5 key features to look for in AMP WordPress plugins and themes are essential for maintaining control over your business’ brand image and user experience. From the color scheme to page control, loading time, and advertising space, a visitor’s experience is solely influenced by your ability to guide it. Thanks for reading. Feel free to leave comments and questions and happy hunting.